This morning I tried out the Warlords of Draenor world PvP zone, Ashran, as well as running several random lvl 100 Battlegrounds, and I thought it might be worth going over some of what SV PvP is looking like in the Beta. First of all, I had a ton of fun running around Ashran. I'm not totally convinced it's going to work quite as well once WoD is live, but in the beta, when everyone has the exact same ilvl gear (all 690 conquest gear), it's really fun right now. For those unfamiliar with the Warlords vision, Ashran is set up to be the World PvP zone. When you enter the zone, it will put you into a specific phase/instance, in order to balance the number of players (right now there's only one PvP lvl 100 realm, but I assume this will be cross realm when WoD is live). Once in, there are a number of objectives you can try to accomplish, or you can run in and smash heads with the opposing faction. However, it's not like a Battleground objectives are significantly more important than actually killing your opponents. Here either are viable ways to spend your time. For hunters, we can easily explore the whole zone while Camo'ed. There's an ogre area, a fungal area and a quarry area in the corners of the island. 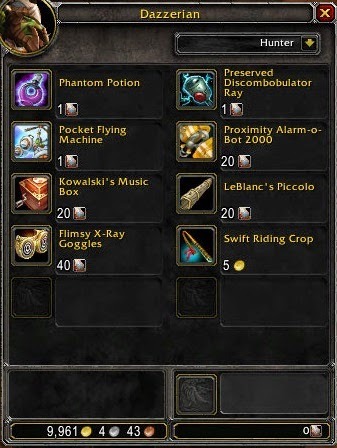 Each of these have various NPCs that can be killed to gain Artifact Fragments (which are used to purchase Ashran only toys/items such as the Preserved Discombobulator Ray, which lets you dismount an opponent trying to flee, or the Phantom Potion, which gives you 25 seconds of invisibility along with a speed boost) or various other temporary buffs/abilities. In the middle of the map is the Road of Glory. This is where the bulk of the battles between the Horde and Alliance will take place. It's basically a big advance and retreat battle, where one side will push forward and try to take thing, and then the other will try to push forward. This area also has the added bonus of Faction Captains, which are NPC's modeled after high profile wow PvPers that come out to help a team if they are outnumbered. I haven't explored this part enough yet (it's too much fun to just rush into battle and try to kill everyone), but it seems like there may be a way to encourage these NPCs to come out by turning in resources to your faction. For those who were either worried about PvP in WoD, or were excited about it, I'm going to have to burst your bubble a little bit. I only did a few random BGs plus my time in Ashran, but so far, not much has changed. A healer is still worth 2 or 3 damage dealers. A warrior can still keep you stunned continuously. And you'll still spend a lot of your time feared. I was one of those who was really excited about them taking away a significant portion of CC, but so far, they haven't gone nearly far enough. A few weeks ago, one of the Blizzard Devs (I can't recall if it was Holinka or Celestalon) tweeted that Survival was the highest ranking pvp spec in the alpha, which is a lot of why I wanted to try it first. Most of the reason they were considered so good is the Improved Camo perk. However, that's not going to be enough to really bring us a lot of pvp glory, now that the new Lock and Load mechanic is in placed. The problem is, even with the glyph, while casting you are very visible while shooting. So a half decent warrior will know very quickly to stun that camo'ed hunter. If you're going 1v1 with a caster, it will be more useful, but if they have any teammates around, it is easily countered. The times it does come in handy is when doing some guerilla warfare, sneaking around and surprise attacking someone. Does this make me a jerk and a bit cowardly, perhaps, but it is a lot of fun. You've got six seconds to wail on someone, and even if it is a warrior you're going against, so long as you're standing back at 40 yards, it'll take them a while to get to you. I actually only managed to find a couple players out roaming alone; both of them I got to about 60% health without taking a single hit. What's really going to be rough, however, is the loss of Kill Shot. Having two, focus-free reasonably powerful shots to finish off an opponent who's getting low was invaluable. As it is, not only do we not have Kill Shot, but we also don't have focus-free Lock and Load Explosive Shots. So there's no way to unload all of your focus to burst someone down, because without anything being focus-free, there's just not enough for any significant burst. For Ashran and the BGs, I used all Multi-strike enchants, along with MS food and Flask, but it still wasn't enough to make LnL a real factor in PvP. It is nice to fire off a couple in a row, but with the focus cost, and unpredictability that came with the removal of the ICD, focus management is going to be very tough. There are few things more frustrating than getting someone down under 20%, having LnL proc and not being able to use it because I hadn't saved up enough focus for all of the procs. And oh my those are the longest cobra shot casts you'll ever see. Even when considering I didn't really play SV long enough to really get my reflexes honed in, or to get my new rotation perfected, it seams like we will be severely lacking in burst. I can imagine situations where an RBG leader may want to bring an SV hunter, I don't think that initial damage while Camo'ed will be enough to make SV a great Arena Spec. Of course, things could change, the Devs have made clear that damage adjustments are still to come. 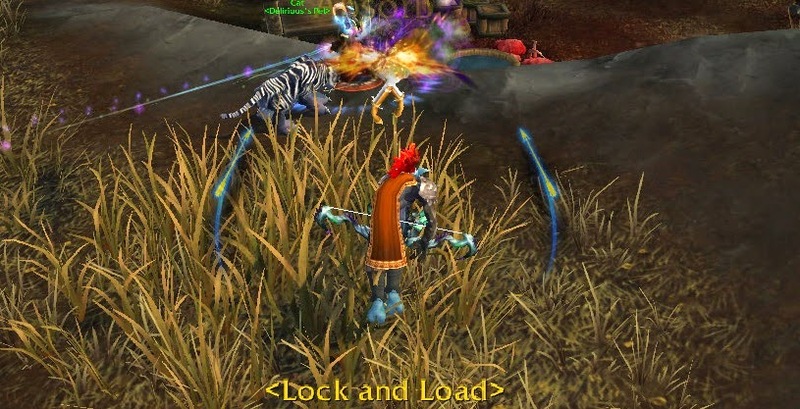 I really did have a lot of fun playing in Ashran. SV certainly isn't terrible, but it looks like we'll be sitting right in the middle of the pack for PvP. I'll be checking out BM and MM here shortly. I'm really looking forward to getting to hit that Kill Shot!